... it's a bright + happy morning! switched out our dark herringbone pillows to these hot summer ones for our bed/room. makes me smile. Wow, love the burst of color! Makes the bed so inviting. Such a great punch of color amidst all the white - love it! I also love the punch of color. On my weekend to do list is to buy fabric for my bedroom pillows...I'm going for a similar look! Thanks for the inspiration and I LOVE your blog! what a perfect photo. this is stunning. my goodness. this is fantastic. nice way to start your day! that's the way to enjoy life!!! Gorgeous! Amazing.. you have such flawless style. LOVE the smattering of bright color against all the white! would you mind telling from where you got the pillows? anonymous - i got them years ago at crate + barrel! You have such flawless style. LOVE the smattering of bright color against all the white! I love your bedroom! This is such a refreshing room. It seems so relaxing and comforting. 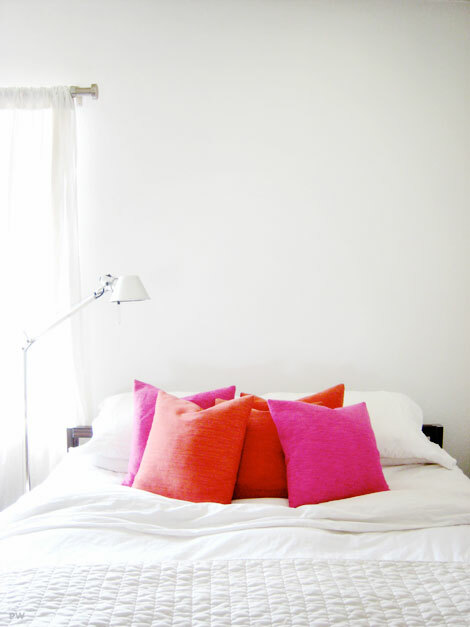 The bright pillows are a nice touch to the whiteness of the space. Thanks for sharing this photo.